Figure 1. 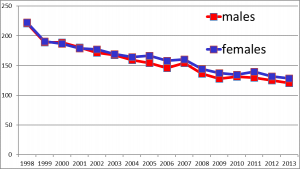 Temporal trends in adjusted mortality rates by cause in Israel, 1998–2012. Data obtained from the official annual published data of the Israeli Central Bureau of Statistics 2015 website. http://www1.cbs.gov.il/briut/new/tab3b.xls (10 August 2015)]. “The number one killer is being contained,” the authors report. They explain that cardiovascular death includes acute myocardial infarction, ischemic heart diseases and arteriosclerosis, cerebrovascular diseases, diabetes mellitus, and hypertensive disease. 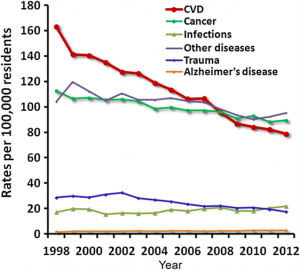 Discussing the reasons for this dramatic plunge in cardiovascular mortality, the authors credit the Israel Heart Society for introducing, publicizing, and teaching prevention of atherosclerosis through lifestyle modification, as well as launching national campaigns against smoking, obesity, diabetes, and hypertension. In addition, they cite the liberal use of statins to achieve the new lipid goal targets, along with Israel’s careful investigation of patients with chest pain. Enumerating the medical interventions that are responsible for saving lives of patients with heart disease, they specify: the very early management of acute heart attacks–initially with thrombolysis (dissolving dangerous clots in blood vessels) and now with immediate interventional procedures within two hours of the patient’s pain onset; the extensive use of emergency ambulance services throughout the country, including rural areas; specialized intensive care units in all the regional hospitals under the care of experienced cardiologists; use of the new anticoagulants; the careful management of cardiogenic shock; programs aimed at preventing sudden death; percutaneous coronary angioplasty for patients with significant coronary artery disease; the use of the new generations of stents; the judicious use of coronary artery bypass grafting; the appropriate use of national trans-telephonic monitoring for patients with chest pain and palpitations; interventional procedures for arrhythmias; the free use of pacemakers and implantable defibrillators; the early treatment of valvular disease by surgery and interventional procedures; and early corrective surgery for congenital heart disease by experienced surgeons.